This month’s Recipe Redux is presented to you by dietetic intern, Novarah Ott. “Start smoking in the new year” [with flavor!] is the theme of this month’s Recipe Redux. Smoked flavors are slated to be a big food trend for 2015 and one of my personal favorites. Now if you’re like me, thinking of smoked flavors conjures thoughts of grills, smokers (the cooking kind) and sunny days. Unfortunately, it’s only January and months away from summer and the smoked flavors of the grill. Thinking outside the box, I looked for smoked flavors in different places and came across a wonderful smoked tea. Lapsand souchong tea is a black tea that orginated in the Wuyi region of China. The tea is smoked with pinewood, giving it a signature smokey flavor. 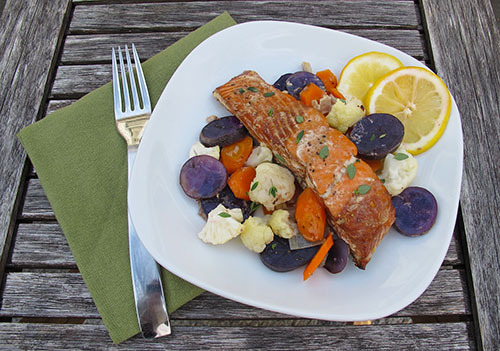 Using the tea as a marinade infuses its wonderful smokey flavors into the fish; no smoker or grill required. Of course smoked salmon is a flavor most people know and love. Salmon is traditionally cured, then cold smoked using hardwoods. This complex process can cause it to be quite expensive. 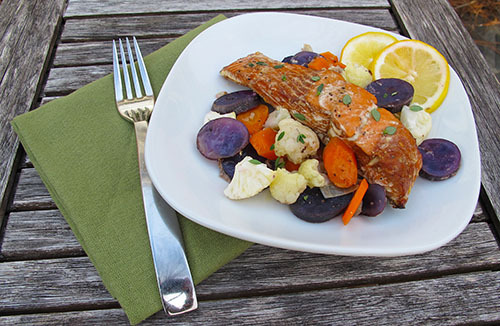 The smokey fish packets in this recipe get their mild smokey flavor from the lapsand souchong tea marinade and can be conveniently made in the oven. This is actually quick and easy to prepare. Cooking the fish in parchment paper allows the fish to be steamed along with the vegetables. I like to use a variety of colorful vegetables to make a beautiful presentation. I always eat with my eyes first! This recipe is easy to assemble, cook, and clean up. Requesting help in the assembly process can make it a fun activity for the whole family. 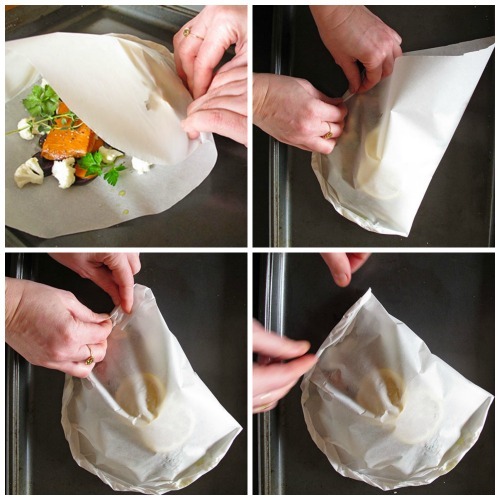 Making parchment paper packets is a preparation I have done many times for its ease and presentation. The ingredients can be interchangeable; usually I just use whatever is hanging around in the refrigerator. If you don’t have salmon on hand then any fish will do. Just remember to adjust the cook time as some fish may cook faster or slower than salmon. These smokey salmon packets are quick and easy. 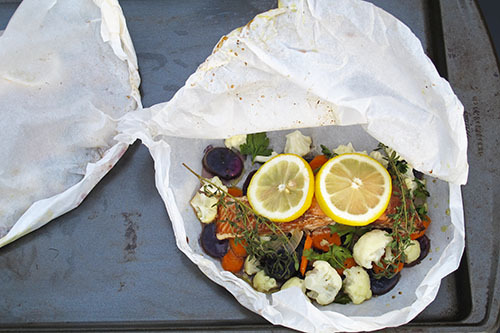 Using parchment paper to make the packets, you can try endless variations of ingredients and flavors, but these are meant to bring the flavor of the grill to life, even if the weather isn't quite cooperative for grilling. Boil 4 cups of water over high heat, remove from the heat, and add the tea bags. Allow to steep until cool, discard tea bags. 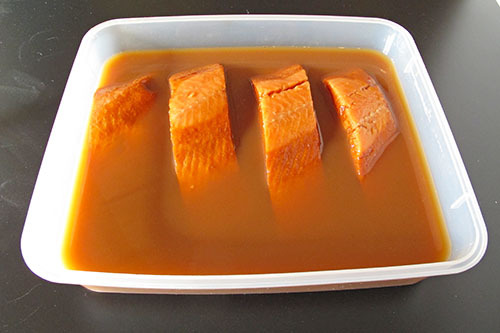 Marinate salmon fillets in tea overnight, or for at least 4 hours. Remove fillets from marinade and sprinkle with salt and pepper. Reserve marinade. Cut 4 large squares of parchment paper. 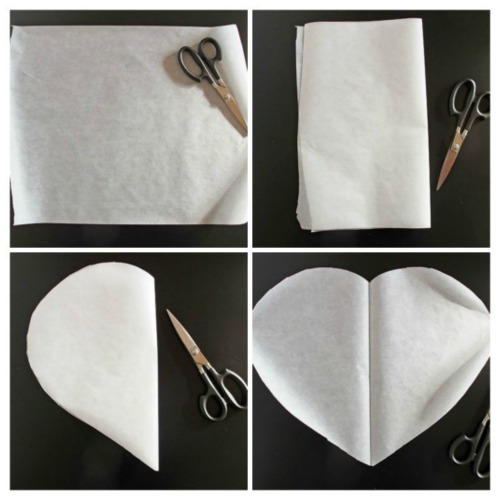 Fold each square of parchment paper in half. Starting on the folded side, cut a half hear shape out of the paper. Open the fold and you should see a heart shape. 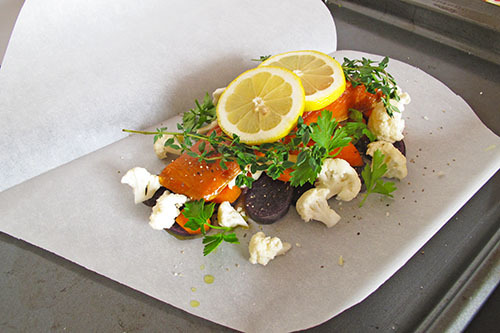 For each parchment paper packet: drizzle ½ teaspoon of olive oil on one half of the paper. Then place ¼ of potatoes, carrots, cauliflower, onion, and garlic. Sprinkle with salt and pepper. 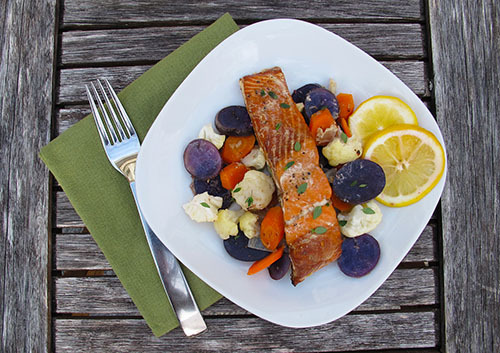 Top vegetables with one salmon fillet, 1-2 teaspoons of reserved marinade, and ½ teaspoon olive oil, 3 sprigs of thyme, 1 tablespoon of parsley, and 1 to 2 slices of lemon. Fold parchment paper over and roll edges together starting with the rounded side. When you get to the pointy end of the paper, fold it back towards the rolled side and roll it in to seal. Repeat with remaining packets. Place fish packets on a baking sheet and place in the middle rack of the preheated oven. Bake for approximately 20 minutes or until fish and vegetables are cooked through.To serve, open packet and discard thyme sprigs. Transfer to a plate. Hey y’all! I’m Novarah Ott, Dietetic Intern at Life University, where I also received my undergraduate degree in Dietetics. I enjoy all things food and am constantly looking for new flavors and ingredients to work with. I love sharing my culinary explorations and showing people that healthy food can be delicious. Working with seniors is my passion and I plan to focus on helping people maintain optimal nutrition as they age.